Our littlest guy isn't so little anymore. Tate just turned the big 0-7. And I don't think he could have had a better day. He got a brand new bathrobe — the perfect gift for a kid who wears pajamas every minute that he's home. He spent hours playing with his new Football Guys, lining up plastic linemen and defensive backs, repositioning running backs, and making sure the referee was where he needed to be. He went out to a fancy a lunch at Arby's. He went to Play it Again Sports and tried on umpire masks and hockey goalie sticks. He found a $1 copy of Madden 2012 for the Xbox at the D.I. 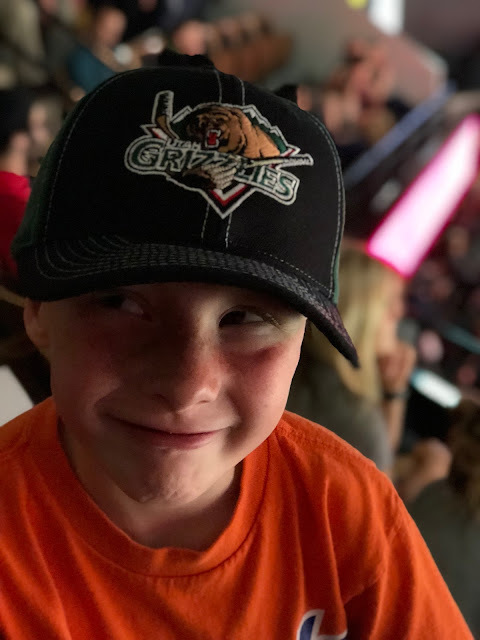 And he spent his evening at his happy place: the Maverik Center, watching the Utah Grizzlies. The simple joys of being seven.